HYDAC Gas Filters GCF are high-performance change-over duplex coalescing filters in stainless steel. They are for use in dry gas seals in turbo compressors. 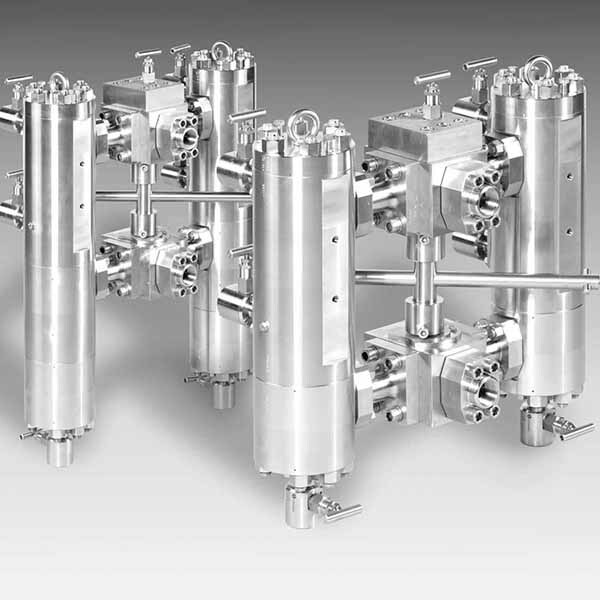 What’s more, all the filter components, including the filter housings, are made of stainless steel machined parts without weld connections. They also comply with the requirements of API 614-5. A coalescer version with integrated cyclone pre-separator. It is mainly for applications using wet gases which may also contain aerosols, oil mists and/or condensates. On one hand, the modular filter design means that it is possible to retrofit a cyclone pre-separator to an existing standard filter. To do so, we need to replace the individual filter housing parts. On the other hand, the filters are also available in a “Double Block & Bleed” version, for special high-pressure applications or those using hazardous gases. Furthermore, it is possible to individually adapt the materials of the seals and housing to the process conditions. FKM and NBR are used as standard and are also suitable for high decompression rates. All seals on the filter are without exception duplex seals. The housing material is as standard stainless steel.